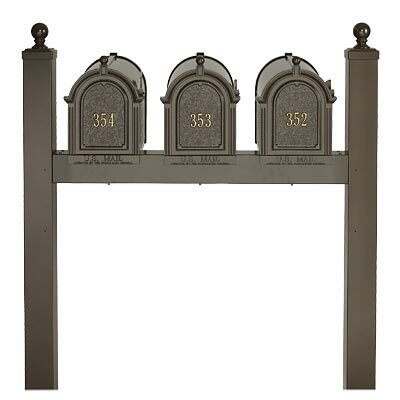 Create a convenient and elegant mail station for you and two neighbors using this Whitehall French Bronze Triple Personalized Mailboxes Package. This durable and wonderful package is perfect for row houses or condominiums, containing 3 separate mailboxes with personalized front panels on a generous frame. The bronze color of each aluminum piece brings a traditional hint to your street side, and the significant boxes each hold a few days worth of mail. Install wooden 4 x 4 posts (not included) into your soil, and slide the included, aluminum posts over them. A small orb tops each of these upright units, and an additional, 42" long, horizontal piece connects the two together and acts as a support for the 3 included mailboxes. Showcase different house or unit numbers on each box by customizing the front panels with up to five 1.75" tall characters. The gold tone of the characters on these panels contrasts the bronze background, while highlighting the gold colored flag on each. A generous door with magnetic closure keeps your mail secure, and a small orb atop each receptacle echoes that of the posts. The all aluminum construction remains lovely for many seasons, while the finish lends it a timeless look. Collect mail for a few homes at once with this French Bronze Triple Personalized Mailboxes Package. Assembly required.